This product contains 8 fun fluency passages about zoo animals. The passages are Elephants, Giraffes, Tigers, Monkeys, Hippos, Lions, Flamingos, and Zebras. 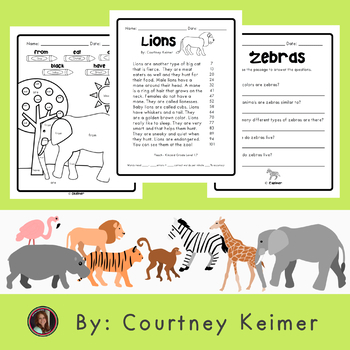 There are 2 pages of comprehension questions, an extension activity and a Color-by-Sight Word page to accompany each passage. The fluency passages range from 1.5 - 1.8 Flesch Kincaid readability levels. They are all on a first grade reading level. You could use this file for whole group instruction, small group intervention, or even homework. You can use 1 fluency passage per day, or 2 fluency passages per week. 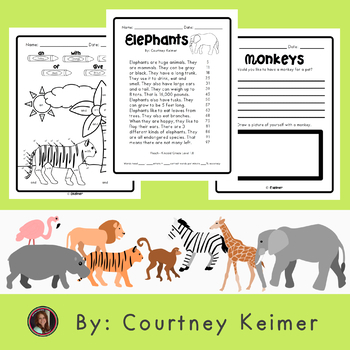 For each passage there is a teacher copy that you can print in color and reuse. There is also a black and white copy that you can print off for each student to record his or her scores on it. 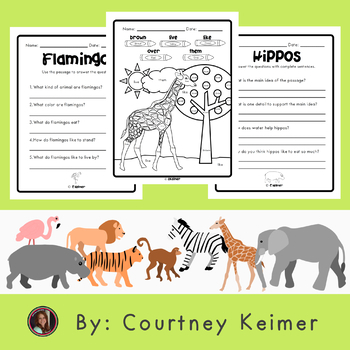 The comprehension questions and activities allow students to spend time on each selection and participate in close reading strategies to build reading skills. It draws upon Bloom’s Taxonomy to encourage higher levels of thinking skills. 3) Hot read, discussion, extension activities (Highest levels of Blooms Taxonomy including Evaluating and Creating). The materials in this packet are aligned to several First Grade Common Core Language Arts standards. 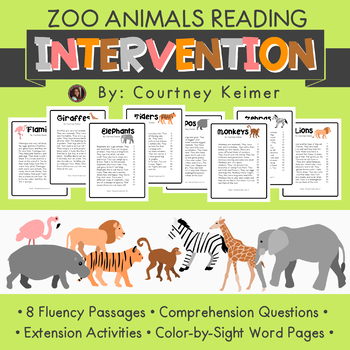 I try to make my fluency passages a little more fun than other ones I’ve used and who doesn't love the zoo?! You can use the “My Fluency Progress Monitoring Graph”(available for free in my store) to track students’ fluency progress with this packet. I also included labels for file folders to create “fluency files” for each student. The extension activity for each passage includes a writing activity and a Venn diagram cut and paste activity for each 2 passages read. Feel free to use the Q & A link for any questions you might have! If you like this, please leave me feedback and follow me! I appreciate it SO much. I’m so happy to share this with you!